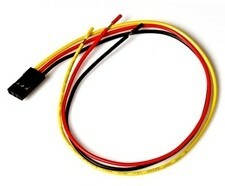 Usage: This cable is ideal cable to connect Maxbotix UltraSonar's to your ArduCopter electronics. Solder the open end to the Maxbotix sonar unit and the other end then connects on to the pin male pin header on the ArduPilotMega IMU board. Good product, speedy delivery, great service. A cable is a cable. Though I didn't end up using this on the Sonar, as it needed more pins. Nothing wrong with it at all, really, except that the connector in the sensor board end could have been slightly shorter. That would have made it easier to fit the connector between the sensor board and the mounting plate in the 3DR kit. Essential to connect sonar/range finder. Actually it is a wrong type of cable. All the threads mention that a shielded cable must be used. So, there should be provided a shielded lightweight cable for the sonar. Hello Nikolaos, The shielded cable is only needed if you are running the cable past high EMI caused by battery wires or ESC's etc. If you do not run the wire in these "zones" there is not a need for a cable shield. I will look into finding a "sleeve" to offer as an additional option on this product, thank you for your review!